Hello my name is Donna Kay and I am an Over Pinner!! Here's a screen shot of my Avenger's Party Board. 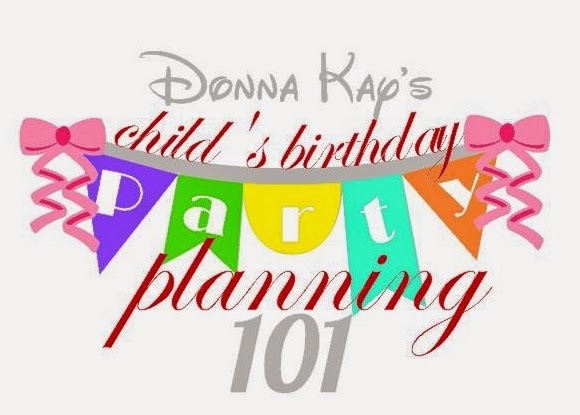 My best advice to you when using Pinterest to plan your parties - OVERPIN with me. Let me explain. When you are searching for ideas to pin for the party (remember to use Google and Bing, not just Pinterest) pin everything you like, whether you think you can recreate it or not. This board is for inspiration, you don't have to duplicate it exactly. What does this accomplish? You can narrow down the design by seeing what ideas you are naturally drawn to. For instance, when I began pinning for the Avengers party I quickly saw that I was pinning a lot of "Comic Book Avengers" compared to "Movie Avengers", so it was easy for me to see the direction the party needed to take. TIP: If the guest of honor is old enough ask for their opinion, let them look at your board and choose the pins they like best. You can decide what you can make yourself, and what you will need to purchase. I am the queen of DIYers, I take it as a challenge to recreate things I pin. That being said, there are just some things I cannot make myself. I can bake some pretty cupcakes, but I won't make the Birthday Cake myself, I hope to be the Queen of Fondant someday - but that hasn't happened yet. I don't sew, so making a cool Iron Man costume I saw on Pinterest isn't going to happen. Be realistic about your abilities, your time frame and your budget. TIP: Weigh the costs of making vs buying - it's not always cheaper to make things your yourself. You can see what you DON'T want to do. I'm not talking about the epic "nailed it" fails on the internet. What I mean is look at your pins and see what isn't there - odds are if you didn't pin a banner your party doesn't need one. As a matter of fact there is no Party Police to come arrest you if you don't give out party favors or have a giant birthday cake. There is no right or wrong - just what makes you and the guest of honor happy. TIP: Don't think you have to have ANYTHING unless it's what you want - just because Tommy's party had a Jumping Castle doesn't mean you have to. On the same note, if you pin 10 of something, odds are it is a "must have" for your party. If you pin 10 different candy tables, then you are most likely going to need one for the party. This can help you when narrowing down choices to fit your budget, we all wish we could have everything we pin but that's not gonna happen. TIP: When you are finished pinning (or think you are) look at your board and "Like" the pins that are your favorites, this will help you decide what you are definitely having at the party. I ALWAYS make sure that the Pin goes to the source. Have you ever clicked on a Pin only to find out it just opens the picture in another tab. That's very frustrating and you don't want to find that out when you are getting ready to purchase or make items for the party. I search for similar terms. I will use our Avenger party as an example, I have also searched Super Hero Party and searched for parties for each individual hero (Iron Man, Hulk, Captain America). I search for specific items (Avengers Party Food or Avengers Party Decorations) to keep from being overwhelmed with so many different pins to look through. If my pin takes me to a party I look through all of the photos there for ideas, and pin others that appeal to me. I have found some great additional ideas this way. I do a Google or Bing image search, who knows there may be some great ideas that don't come up in your Pinterest search. Hopefully this will help you conquer your next Pinterest Party Board!! If you have any questions feel free to leave them in the comments or on the Disney Donna Kay Facebook page. 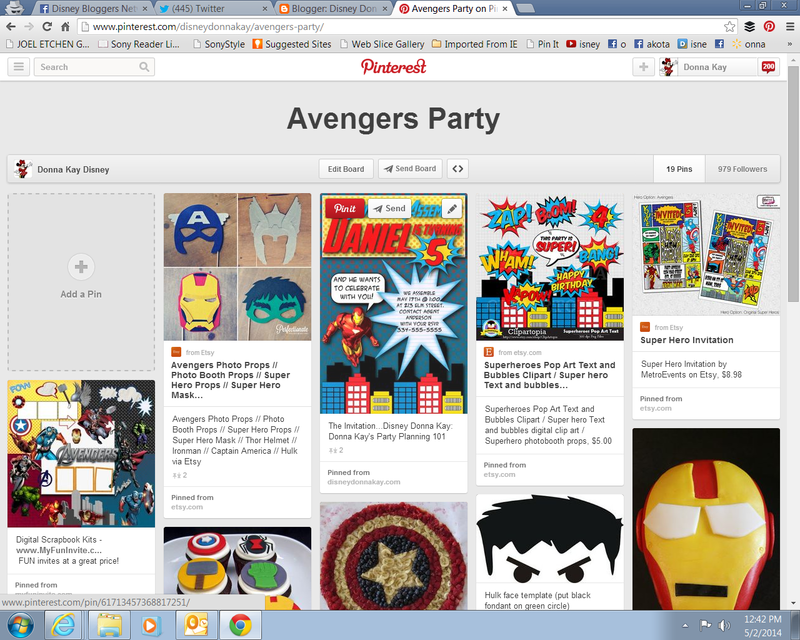 Here's a link to the Avengers Party Pinterest Board just in case you want to follow it. Such an inspirational post.. These ideas will greatly help to plan my daughter’s birthday and good thing about this is easy to implement and full of fun. Thanks for sharing this post. I'm such a visual person and Pinterest helps me tremendously. It drives me crazy when a particular pin I like goes to a random website. I always check to see if it goes to the source too. We have a very similar planning style. Imagine the damage we could do if we got together ;) Great tips!